As mentioned in this post, I get so excited when I find a great bargain. My most recent bargain buy is this Trellis kilim rug from Rugs USA. Rugs USA has a store location in Long Island where my mom lives, and it’s only an 1 1/2 hour drive from my house, and about a 10 minute drive from hers…lucky! I recently visited and found such great product. I left with this 5X8 rug for less than $200. I have been looking for a rug like this, but all the ones I found were at least double the price. When I shopped they were running a 75% off sale, and just noticed they are running it again! Use the code summer75, plus they are offering free shipping. It looks like they only have the 8X10 left for $288 which is really an amazing price. I have emailed the store and will post whether they are getting the 5X8 back in stock. By the way, they call the rug light grey, but to me it is a blueish grey which is what I was looking for. They have many similar style rugs in the 5X8 size. Here are some, but check out the website for others. This Tuscan Elmer 5X8 size is only $127. 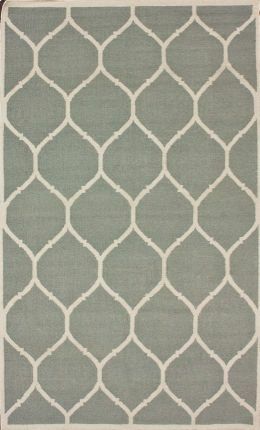 This Morrocan Trellis 5X8 is $108, wow! The Homespun Royal Enchant, a great 6′ square is $104. So pretty, the Radiante Hearts Beige 5X8 is only $104. What a statement piece. This Radiante Lantern Ikat 5X8 is $104. This is not a sponsored post. I just love product, and finding a great bargain.